A few times per year, I get on this kick where I feel like "Everything Must GO!" I go through the house with a box and fill it with all of the nic-nacs and junk that has accumulated. I go through my closet and throw out worn sweaters and things that I haven't touched in a long time. I got the house all de-cluttered last week and after that was done, I moved on to the basement. Oh the nightmare that is my basement. About 1/4 of the space down there is filled with racks and totes full of vintage clothes. 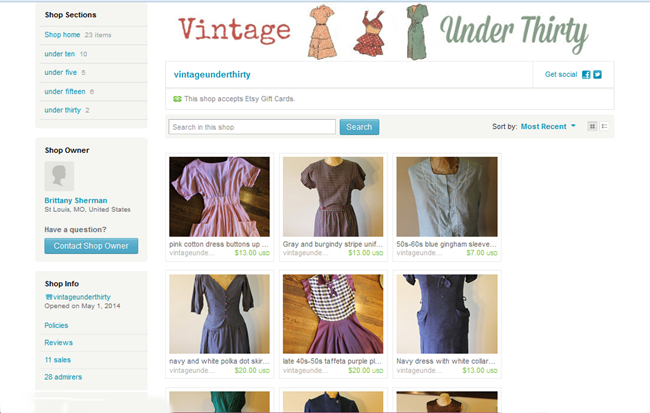 I bought several car loads of vintage about two years ago with the intention of starting a vintage shop. I did that for a while but I really don't have time to make all of those repairs and work out stains. The dresses just sat there. I've decided that its time to let things go. Stop being a reality tv show hoarder and just let it go. I won't have time to sell vintage again till the kids are in school so let's stop being silly. 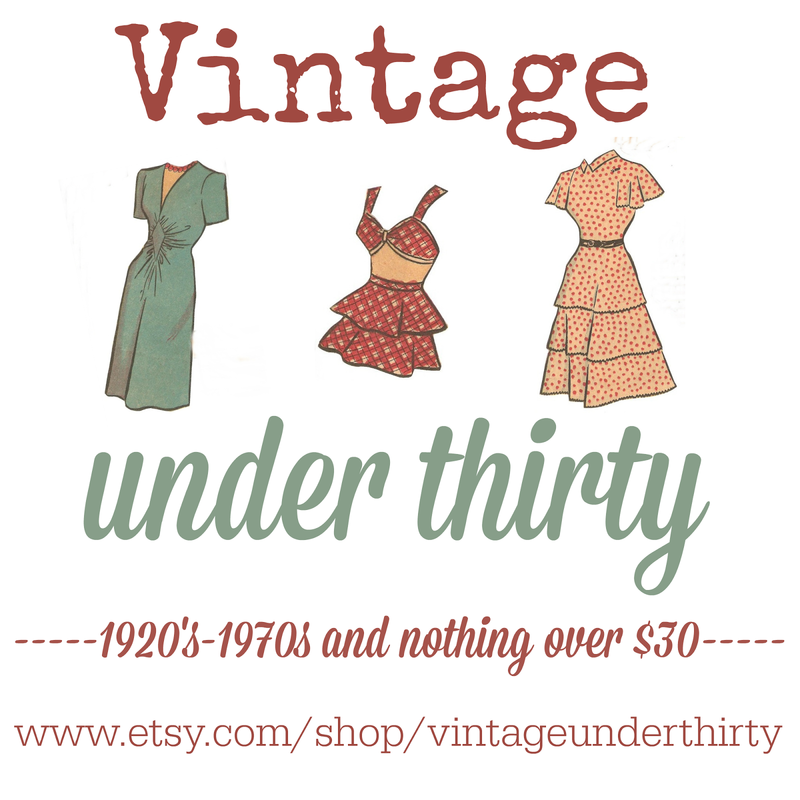 Yesterday, I opened a brand new etsy shop, Vintage Under Thirty. I'm listing everything in my hoard, all 330 pieces (minus a few that I can't part with because I have no self control). Everything will be priced ranging from $3-$30 each! Some things are damaged (need a zipper, buttons, dye job, full over-haul) and some are not so please read all descriptions carefully. All sales are final, no returns or refunds but do send me a convo if you have any questions before purchase. Swing on by and grab a great deal. There's a lot of things that would turn out beautifully with the help of a clever seamstress and plenty of things for vintage sellers too. I cannot accept wholesale requests or requests to buy all items from a certain era. I'm taking this project on by myself and it's been pretty overwhelming trying to process everything through the shop. I want to share my finds with everyone and give all of you a chance to get a great deal on vintage. I do combine shipping on multiple orders and I'll do my best to find the cheapest rate possible. When the vintage is gone, I'll be setting up my new sewing room in this space and with the funds, we'll be going on our first family vacation next year. That pink dress is a dream though it is so tiny! If it were a little off, I could say hey when I lose a little weight, but I have no delusion that I will ever be able to fit into that beauty. Hope you can liquidate your vintage hoard!!! I love this idea. I want to go back to selling on etsy even if they charge per listing. They were so much better than ebay. Oh my god, I think this might be the best store on Etsy! Some of the problems I've seen on Etsy, with vintage or modern clothing resales is that people really have baggage with their clothes and the prices really reflect their sentimental attachment. I love this realistic approach to liquidation! Oooohhhh, I am so excited! Can't talk -gotta go and look in your store!